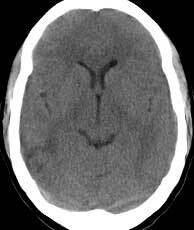 Findings: Faint area of low attenuation in the cortex of the posterior right temporal lobe (a). Optic chiasm (chi). Supraclinoid internal carotid artery (ica). Suprasellar cistern (ssc). Basilar artery (ba). Nodulus (nod) of the vermis. Mamillary body (mam). Interpeduncular cistern (ipc). Inferior colliculus (icol). Cerebral peduncle (cp). Sylvian fissure (sf). 3rd ventricle (3v). 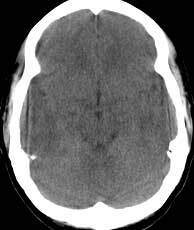 Perimesencephalic cistern (pmc).